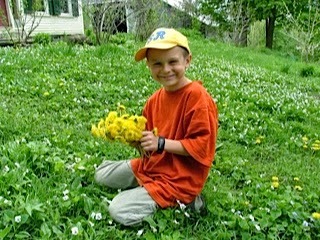 The first time I heard that dandelions weren't native to North America, I didn't believe it. Then came the hard truth that Vermont's state flower, the red clover isn't a native. Then earthworms (well most species), potatoes, garlic and all apples except the crab apple fell from grace. I think I nearly lost it when I found out honey bees had been imported. To most of us, the dandelion is considered a weed. Unless you're making a dandelion chain necklace, or playing the mommy had a baby and… you know the rest- game, it's regarded as a troublesome pest. It invades our gardens and lawns, and those gorgeous yellow flowers turn into poofy,white turbans that stick to everything and fly everywhere. But in Vermont, where there are literally 9 months of winter, when those first Spring shoots come poking out of the ground, they are cause for celebration. And their astringent, earthy taste is just the tonic we crave after months of grocery store produce that all tastes like wax boxes and is as crunchy as cardboard. Like radicchio and chicory, it's a breath of fresh air after weeks of iceberg, or if you're a real purest, no greens at all. I've used dandelion greens for tea, raw in salads, and chopped in smoothies. The greens are best before the flowers come out of their pin cushion-like knobs, and they certainly are too bitter to eat after the flowers are in full bloom (though the blossoms make awesome wine). I chop the base off, pull out any leaves that have hung on through winter's cold (they'll be pale and wilted), and steam them. Then I rinse them and squeeze all of the excess moisture out. I chop them fine and use them as I would steamed spinach or kale. Besides my pursuit of how best to eat weeds, I am a bit of a cookbook hoarder. People ask me why I still read cookbooks now that everything can be found on Dr. Google. I just like the feel of the book in my hand, and the ability to jump from page to page and back again without getting dizzy when those pages go flicking by on my Kindle or my monitor. I have Judith Olney's The Farm Market Cookbook (1991). In it, she describes farmer's markets across the country and how they've contributed to bringing the farm back to the table. There is a recipe for Maggie's Spinach Nutmeg Muffins for which I used dandelion greens instead of the spinach called for, and used smoked gouda cheese instead of Swiss cheese (dandelion greens are amazing with bacon, so the smoked cheese kind of reminded me of that pairing). Ironically, I googled Maggie Middleton, who at the time of Olney's writing, owned with her partner, a burgeoning bakery business in Carrboro, NC. She retired from the business just 6 years later, died in 2009, and requested that donations in her name go to LIVESTRONG, Lance Armstrong's charity. How fickle life is, where we perceive one reality, and it later turns into another. Perhaps fame, instead of scandal, will some day be the fate of the harbinger of spring here in the northeast, the dandelion weed. Here is an adapted version of Maggie Middleton's muffin recipe from Olney's book. I made them using gluten-free flour, and they were awesome. Preheat oven to 400 degrees F. Grease a 12-cup muffin tin. Chop the cooked dandelion greens. In another bowl, combine the greens, buttermilk, butter, half of each of the cheeses and the egg. Make a well in the dry ingredients, and stir in the the liquid. Don't combine them to a smooth consistency- they can stay chunky. Spoon the batter equally into the tins, sprinkle with the remaining cheese, and stick them in the oven. Bake for 20-25 minutes. Remove the tin from the oven, and let rest for 5 minutes before popping them out. These are great with cream of asparagus soup. You'll have to pull out a cookbook or google that recipe.